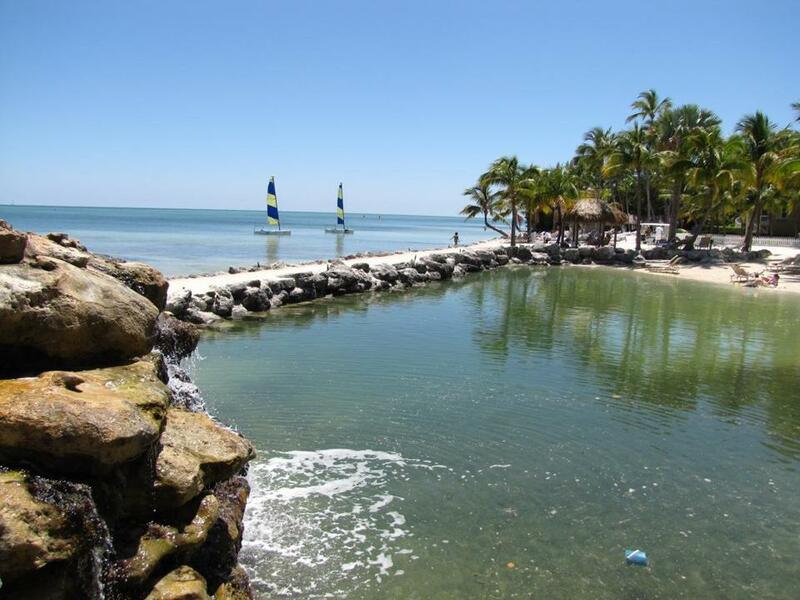 Water sports include sailboats in the ocean near a swimming lagoon at Cheeca Lodge in Islamorada. School vacations, like winter, can sneak up on busy parents. One minute you’re buying new shoes and school supplies, and the next there’s snow on the ground and you’re knee deep in what-are-we-doing-for-vacation panic mode. Located one nonstop flight from Boston to Miami or Fort Lauderdale, plus a brief drive away, the islands of the Florida Keys are an easy solution to winter and spring vacation-planning blues. Many resorts offer onsite family activities, special kid menus, and opportunities for parents to kick back and relax on their own. Tranquility Bay Beach House Resort is located in Marathon, just 90 miles south of Miami and 45 miles north of historic Key West. Checking into the resort is like entering a small coastal village where kids can roam freely without getting lost. Two-story white wood cottages with peaked roofs nestle within 12 acres of gardens connected by paths meandering past three tropical swimming pools, a sunset gazebo, putting green, and 2.5-acre white sand beach with designated swimming area, a watersports center, and waterfront tiki bar. Two- and three-bedroom beach houses allow families to experience all the comforts of home — spacious living and dining rooms, gourmet kitchens, full baths, flat-screen TVs, Wi-Fi, laundry facilities, expansive porches — while gazing at the Gulf of Mexico. More intimate accommodations are offered in single-level garden guestrooms. Outdoor activities abound. Turtle Island Watersports’ onsite activities will satisfy all ages and abilities. Rent kayaks, standup paddle boards, wave runners, Hobi Cats, and small boats by day or hour; take the “kids and family” yoga class; or look for tropical fish, tarpon, turtles, manatees, rare birds, and diverse vegetation on kayak or waverunner guided eco-tours. At the Keys Kids Adventure Camp, various half-day snorkeling and learn-to-scuba-dive classes in the pool are available for ages 5-15. Parents are not included in these adventures, making it a perfect time for in-room spa appointments or a trip to the modest fitness room. For lunch, TJ’s Tiki Bar serves kid-friendly dishes such as wings, nachos, pizza, burgers, hotdogs, and smoothies, as well as parent-friendly salads, wraps, fish tacos, and handcrafted and frozen cocktails. Dine indoors or alfresco at the Butterfly Cafe, serving nightly entrees such as panko crusted grouper, Cuban pork chop, coconut shrimp, and scallop risotto. Items on the children’s menu include grilled mahi bites, pizza, hot dogs, and pasta with butter. Tranquility Bay Beach House Resort offers two and three bedroom beachside accommodations on the Gulf of Mexico in Marathon, Fla. Located midway down the Keys, Hawks Cay Resort is more than a simple tropical getaway. The 60-acre property, on the island of Duck Key, offers a wide range of sports, dining, educational, and relaxation experiences for all ages. Stay in style in one of 177 spacious hotel rooms, or reserve one of 240 two- and three-bedroom villas with comfortable living and dining areas, full kitchens, and housekeeping services. A resort tram circles the property every 15 minutes, making it easy to travel between the marina (the go-to spot for charter fishing, snorkeling, scuba diving, kiteboarding, stand-up paddleboarding, parasailing, kayaking and watercraft rentals), spa and fitness center, tennis courts, restaurants, five swimming pools, saltwater lagoon, and restaurants. Or rent bicycles and pedal your way about. A distinguishing feature of Hawks Cay is its Dolphin Connection program, one of only two in the continental United States (the other is in Las Vegas), an onsite dolphin research facility where guests may train, feed, and swim with five Atlantic bottlenose dolphins in their saltwater lagoon ($60-$325). Young kids and tweens stay entertained at Indies Club, a separate kid-friendly center with Pirate pool, sports venues (basketball, soccer, putting greens), game room with air hockey, ping pong tables, X-Box, Nintendo Wii, and Sony PlayStation. A changing roster of daily kid activities includes painting coconut shells, making tie-dye T-shirts, snorkeling, kayak tours, games of capture the flag, Frisbee challenge, coconut bowling, glow-in-the-dark mini golf, and more. Ages 5 to 12 can sign up for full- or half-day programs at Island Adventure Camp. While the kids are occupied, parents can relax in the full-service spa, which offers messages, facials, exfoliating scrubs, and salon services, or work out in the fitness center with cardio and exercise machines, as well as strength training and flexibility equipment. Dine at one of several venues offering a range of styles and flavors, from the romantic and intimate Alma (Latin cuisine with a Caribbean twist), to the casual indoor-or-out tables at Ocean (sustainable seafood, pastas, burgers, and pizzetas), to lagoon-side seating at the Beach Grill (Caribbean seafood and classic American cuisine). “Splash Zone” menu for young guests includes junior burger, chicken and fish sticks, grilled cheese, and grilled chicken breast. Facing the blue-green Atlantic in Islamorada, Cheeca Lodge offers deluxe digs in a stylish and casual setting. The 27-acre lushly landscaped property is home to a wide variety of family-friendly activities, multiple dining options, and 214 rooms and suites, including spacious accommodations with separate living and sleeping quarters, and full kitchens. However, with more than 1,200 feet of palm fringed private beach, adult and family pools, a lagoon for swimming and snorkeling, a 525-foot pier for fishing — the longest in the Keys — Jack Nicklaus-designed, 9-hole, par-3 golf course, and onsite, full-service watersports facility, you may rarely venture indoors. Water and sport activities are star attractions. Families have unlimited free use of fishing equipment and sea kayaks, and, for an additional fee, can sign up for snorkeling, fishing trips, eco tours, sunset cruises, sailboats, paddleboards and parasailing. On terra firma, the Sport Shop staff can arrange your own family tennis tournament on one of six lighted courts; golf at their seaside course; or map a route through town for shopping or simply exploring on their free-for-use easy-cruising bicycles. At Camp Cheeca, kids (ages 5-12) learn about the wildlife and marine habitats in the Florida Keys while having fun fishing off the pier, snorkeling, and swimming in the lagoon, exploring the beach, going on scavenger hunts, expressing themselves in arts and crafts workshops, and more — all led by knowledgeable counselors. While the kids are at camp, parents can be pampered at the full-service spa, get pumped at the fitness center, or simply loll by the adults-only pool. Picky eaters will find something to satisfy them at one of three restaurants. At Atlantic’s Edge, enjoy fresh seafood, such as guava-glazed mahi and local snapper ala plancha, pasta, prime steaks, and locally grown produce. Limoncello, a casual, Tuscan-inspired restaurant, serves homemade pastas, pizzas, salads, and entrees. (Both offer a full children’s menu.) Or try an extensive list of nigiri, sashimi, and specialty rolls at Nikai Sushi Bar.